Soak 8 bamboo skewers in warm water for at least 30 minutes. While the skewers are soaking, cut pork tenderloin into 1" cubes. In large bowl, whisk together lemon juice, oil, garlic, oregano and pepper. Add pork and stir to coat. Marinate for 10 minutes (can be made ahead of time and marinate up to 24 hours in the refrigerator). While the pork is marinating, preheat the broiler. Coat a baking sheet with cooking spray or line with foil. Set aside. Thread pork onto 8 skewers and lay on the baking sheet so they are not touching. Brush the skewers with remaining marinade, using all the marinade. Place the skewers in the broiler 6 inches away from heat for 6 minutes. Turn the skewers and cook an additional 6 minutes. 97 members have added this recipe to their cookbook. 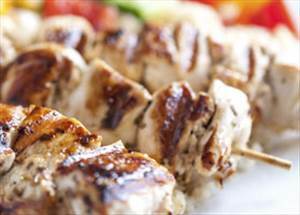 There are 195 calories in 1 serving of Pork Souvlaki. Calorie break-down: 45% fat, 6% carbs, 49% protein.